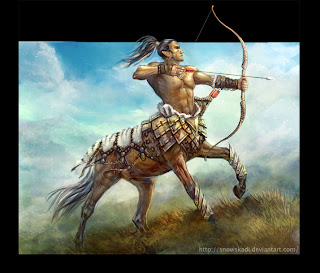 Today's topic for the A to Z blogging challenge is Centaurs from Greek mythology. They have the torso of a human and the hindquarters of a horse. Most believe that they came into existence due to the appearance of riders on horseback for non-riding cultures. For someone unfamiliar, the elegant movements of both the rider and the horse can appear as if the both are acting solely as one being. In classical mythology, centaurs have been considered guardians of their territories and ensured the peace in the nature around them, usually driving the pesky meddling humans away. They're also known for their dual nature of man and beast, usually behaving somewhere in between the two. Centaurs' lifespan is agreed to be much longer than humans, and their magic tied to both earth and the nature surrounding them. Stories also tell of their uncanny skill with both bow and spear, giving even more credit to their "bull striker" name. In more recent times, when the Aztecs encountered Spanish cavalry, the Spaniards were mistaken for being hybrid creatures similar to centaurs. While the more typical view of a centaur is a man and a horse mix, in Russian folklore, there are old tales regarding a human/hound (or horse depending on the variation) creature that terrorized the countryside. It's called a polkan based on the Italian poem I Reali di Francia which featured Pulicane a half-dog character. Their origin dates back to the Bronze Age from terracotta pottery found featuring them. So, what do you think of Centaurs? Have any favorite books or movies featuring them? It never even occurred to me that centaurs could have originated with cultures who had never seen people riding horses. That's kind of cool! I just wonder if they have to sleep standing up. Must get tiring on the back. Mara, I hadn't really thought of that either. It's fascinating. Thanks for the comment! TS, that's a really good point! I have no idea. That probably would get tiring on their back. Thanks for the comment. Totally enjoyed the different take on the prompt. I've always been intrigued with them. Charmaine, thanks for the comment! I pictures the technicolor Centaurs in Fantasia. My brother was briefly fascinated with them and would, during our pretend play, take the role of one (he was a Sagittarius).